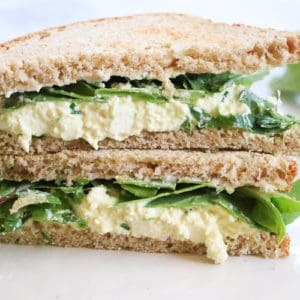 This easy Vegan Egg Salad recipe is created in 5 minutes or less with mashed tofu, vegan mayo, nutrition yeast flakes, and amazing black salt (kala namak) that adds real ‘eggy’ flavor. The texture and flavor might fool your tastebuds into thinking that this is ‘real’ egg salad! 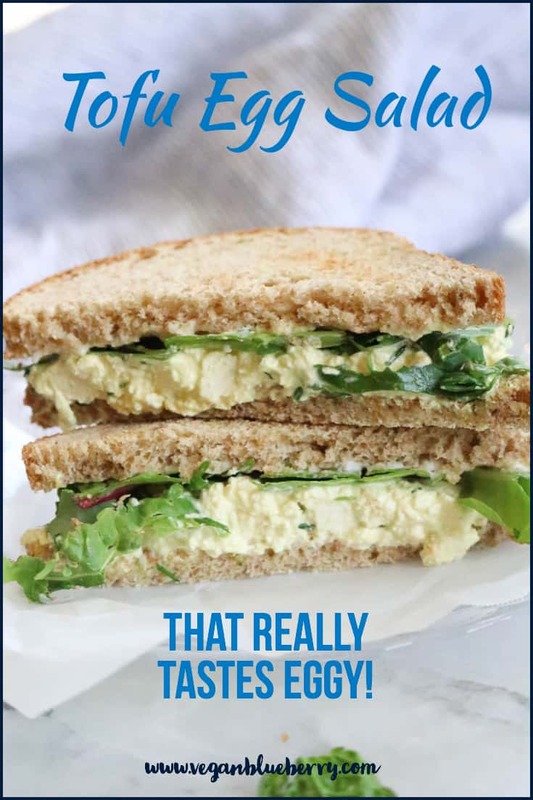 Smash a package of firm, water-packed tofu with a fork, and you’ll see right a way what a great look-alike to Egg salad it is. The texture is great with little chunks and smaller bits masquerading as egg whites! The next steps are easy. This entire recipe whips up in about 5 minutes. Seriously fast and SO tasty. What is Black Salt or Kala Namak? I don’t know why they call this salt ‘black’. It’s really more of a dark-red purple and when it’s ground to a powder above it is more of a light pink color. However, it’s most important attribute isn’t it’s color – it’s the sulphur flavor that it has! When you open the bag you’ll be shocked. It SMELLS like eggs!! Dip your finger in: It TASTES like eggs. 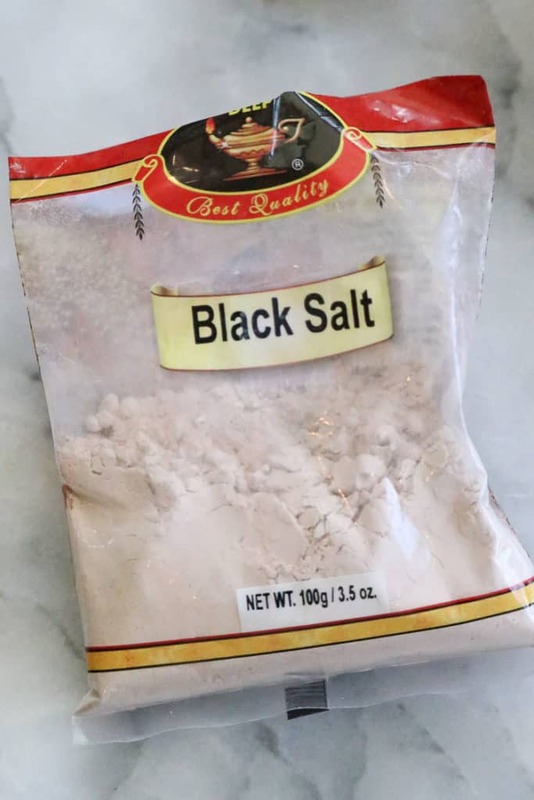 This Eggless wonder ingredient called Black Salt (Kala Namak) is also said to be amazing for your health, aiding in weight loss, bloating and intestinal gas decrease, etc. ,etc. Honestly, I’d eat it for the flavor alone, but hey, even more if it’s so good for me!! 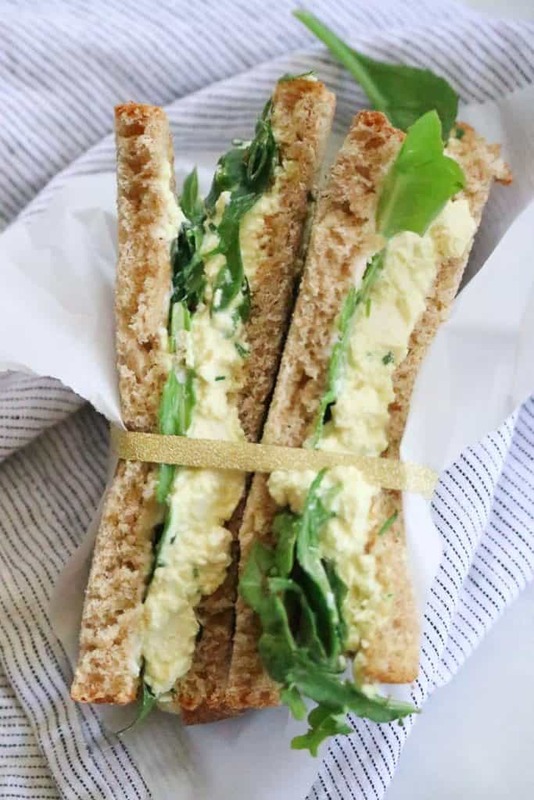 If you’ve tried this Vegan Egg Salad recipe or any other recipe on the blog then don’t forget to rate the recipe and let me know how you got on in the comments below, I LOVE hearing from you! You can also FOLLOW ME on FACEBOOK, INSTAGRAM and PINTEREST to see more delicious food and what this blueberry farm girl is keepin’ busy doing!!! 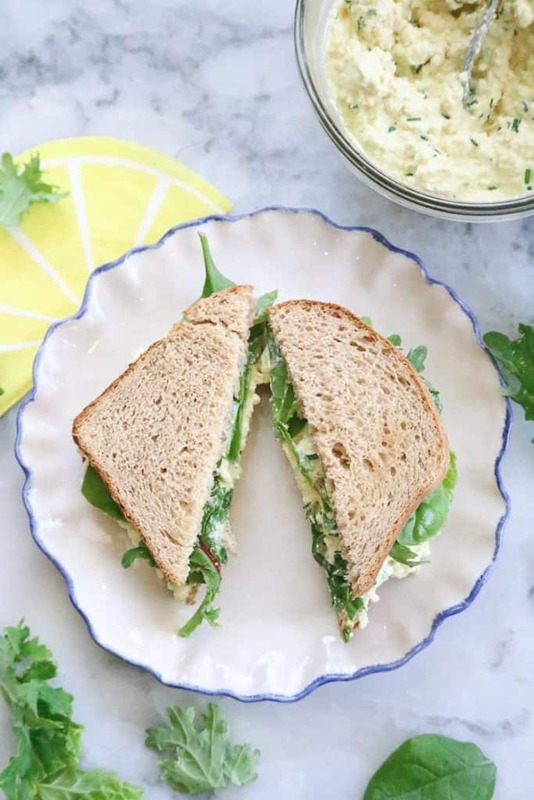 This Vegan Egg Salad might actually fool you into thinking you are eating REAL Egg Salad! Himalayan Black salt is the secret ingredient that adds that sulphur 'eggy' flavor! Delicious and simple, it's ready in five minutes or less! Open Tofu package and press firmly to drain. 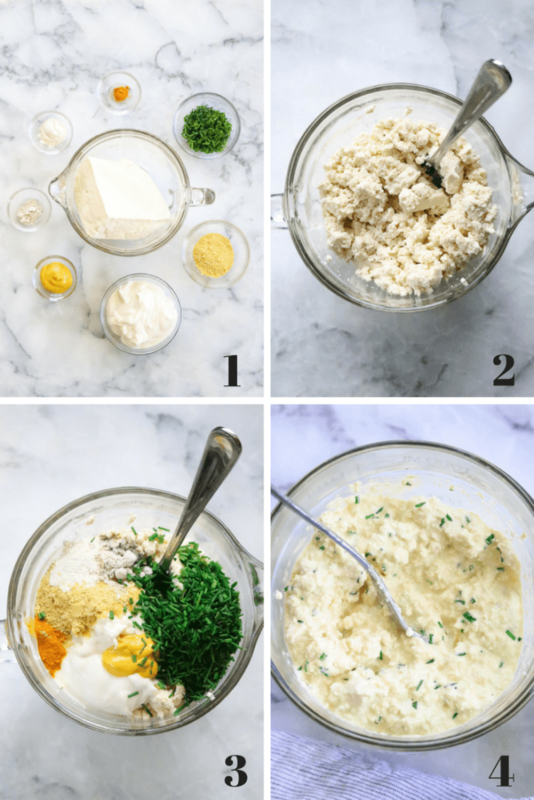 Mash with fork to desired texture. Chop fresh chives and add to tofu. Add remaining ingredients and mix well! Serve on toast or crackers as desired. If you are making sandwiches ahead, just beware that they could get a little soggy if you are using soft bread. If I'm making this for lunches, I usually take the bread and tofu egg salad in separate containers and spread on when I'm ready to eat! Yummy!